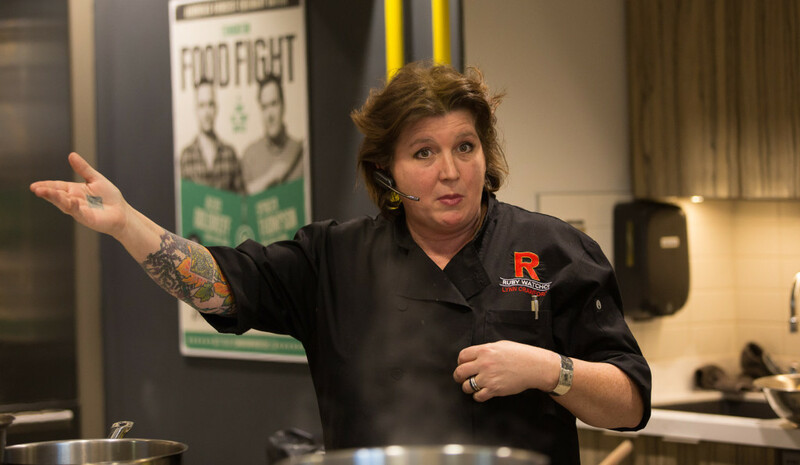 Now, all those near and dear to me will know that I don’t focus on healthy cooking, but… When Chef Lynn Crawford is the doing the cooking, I will make an exception! 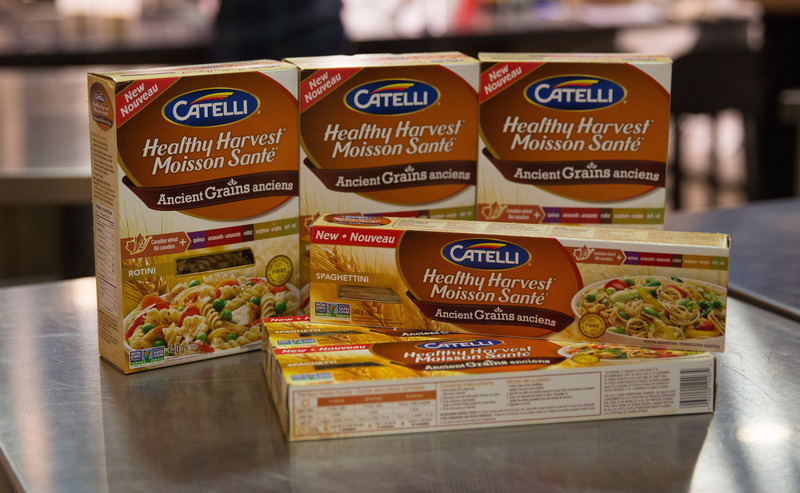 Catelli launched their newest and healthiest pasta to western Canada in January 2015 – Catelli Healthy Harvest Ancient Grains. Available in 3 pasta shapes; spaghetti, spaghettini, and rotini, this pasta is the only 100% whole grain pasta of its kind, made with all-natural 100% Canadian whole wheat and 5 nutritious and high in protein ancient grains, and honestly, tastes pretty darn good. Made of quinoa, amaranth, millet, sorghum, and teff, this pasta still manages to maintain a good bite and texture, despite it being incredibly healthy. We all know a healthy diet should include complete proteins, the 9 essential amino acids necessary for a balanced diet, and this pasta definitely does not fall short of them. The evening starts at the Get Cooking studio at Grant MacEwan’s main campus. Having graduated from NAIT’s Culinary Arts program and being spoiled by a state of the art kitchen, I was equally impressed by MacEwan’s set up. We begin the event with some delicious canapés prepared by the talented chefs from Switch Food, and then Chef Crawford takes the stage and introduces us to the culinary makings of this new pasta. Having only heard of 3 of the 5 ancient grains in the pasta, I was amazed to learn what teff and sorghum were, and of their uses. Teff is a very fine grain, about the size of a poppy seed, that is celiac friendly. It cooks quickly for a side dish and can also be ground into a flours for breads and pastries. I was most impressed by sorghum which has starchy, rice-like characteristics, and especially because it can be popped on the frying pan just like popcorn kernels. The popping similarities to corn was amazing. I suppose healthy eating isn’t all bad! Next came a cooking demonstration led by Chef Crawford. Pesto in a few minutes? 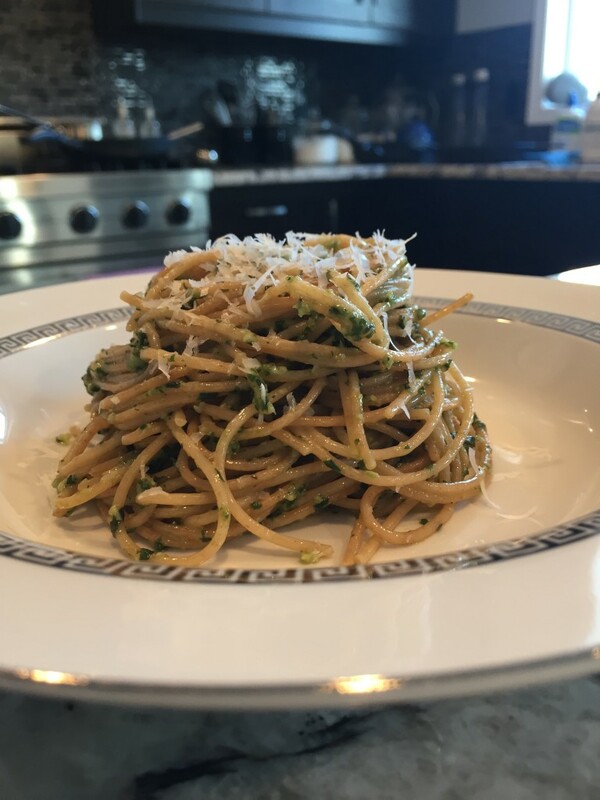 Why yes, you can definitely do that by putting toasted pine nuts, garlic, basil, and olive oil in a food processor (personal recipe to follow). 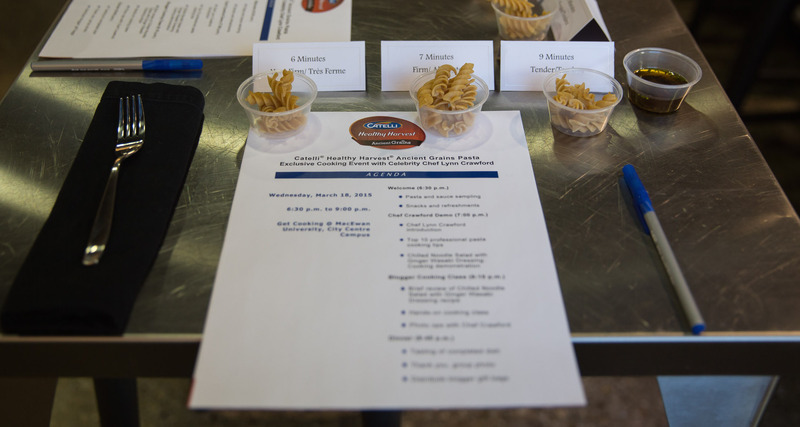 There was emphasis placed on the proper cooking time of the pasta. By ensuring your pasta comes out al dente, aside from the color, you could honestly mistake it for regular semolina or flour pasta. The evening ended with some hands-on cooking by the audience, preparing Chef Crawford’s recipe of Chilled Noodle Salad with Ginger Wasabi Dressing. Photos were taken all around, prepping tips were given by the Chef, and chatter and laugher engulfed the room. Kudos and a big thank you to the marketing team who put together such a professional event and did a fantastic job on selling and explaining this excellent new product. Thank you Chef Crawford for imparting such energetic, and hilarious wisdom upon us, and for being a great host! All images from the event provided by Gail Bergman PR. 1) In a pot of salted water, cook pasta to al dente according to directions on package. Drain and set aside. 2) Place garlic in food processor and finely chop. Stop motor and add pine nuts, cheese, salt and pepper, basil, and continue to process until finely chopped. 3) While the motor is still running, add oil in a steady stream until incorporated but not completely smooth (we want to maintain some texture). 4) Meanwhile, heat up a large sauté pan to medium-high heat. Quickly fry pesto sauce for a couple minutes, or until the garlic becomes fragrant. Add cooked spaghettini and toss until completely coated. Be careful not to overcook the sauce as the cheese will start to melt. 5) Serve hot. Garnish with additional grated Parmigiano-Reggiano. Coupons are available here while quantities last. – leave a comment on this post, sharing what your favorite healthy pasta dish is! The deadline to enter is Sunday, April 5th, 2015 at midnight MST. A winner will be chosen by random and contacted by either email or Twitter. Contest is open to Canadian residents only. Good luck and happy healthy eating! I like pasta loaded with veggies like pasta primavera. Our favorite healthy pasta dish is pasta primavera. I love making one pot pasta with asparagus and grape tomatoes .